Captain Jack Harkness returns to Doctor Who after getting his own spin-off show Torchwood. He’s in for the adventure of his life. The man who cannot die after Rose brought him back to life has been waiting for the Doctor to return for years now. Perhaps even longer than that. As the TARDIS materialises above his Torchwood base of operations in Cardiff, he makes a run for it and ends up hanging on for dear life as ship throws him, Martha and the Doctor to the very last days of the Universe. Here they discover the Human race on the brink of extinction and a lone scientist trying to save the remnants that are left by taking them to last shining light in the universe, known only as Utopia. The Doctor discovers that Professor Yana is a genius, pursuing theories and inventing solutions that are way beyond anything a human could ever do. Of course the Doctor is drawn in by the science and quickly becomes involved in the rocket project but there is something about the Professor that is just not right. With Martha and Jack trying to stop the invasion of a humanoid type race attacking the compound, the Doctor and the Professor face a race against time to launch the rocket and save the human race but Yana is still hearing the voices that have tormented him all his life and they are getting louder. 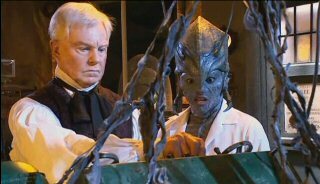 When someone of the calibre of Sir Derek Jacobi joins the series, you know that Doctor Who has returned to the heights of its success. As Professor Yana, the veteran British actor of stage and screen brings the bumbling scientist to life but it is when he realises what the voices are and who he really is that we see why you needed a big time actor in the role. The return of John Barrowman to the series as Captain Jack Harkness is a welcome one, even though he is a little more camp than he was in Torchwood. The actor clearly relishes the role and really has fun with the acting and the continuous running the character seems to do in every episode he appears in. David Tennant raises his game to cope with the return of John Barrowman and having to act along side a legend like Derek Jacobi. ‘Utopia’ is a clearly written episode that will reveal why many of the plot points across the last few seasons were introduced by Russell T. Davies and his creative team. It is this that makes this episode pivotal to the evolution of the series and one that sets up the return of one of the Doctor’s deadliest enemies but more of that during the season finale.